The two-hour Chingay Parade passed by quickly as 180,000 pairs of eyes watched colorful cultural dances and mesmerizing fireworks from the stands. Whether it was Southern Lion Dance or Pole Act flag balancing, the famous parade didn’t fail to amaze its visitors. 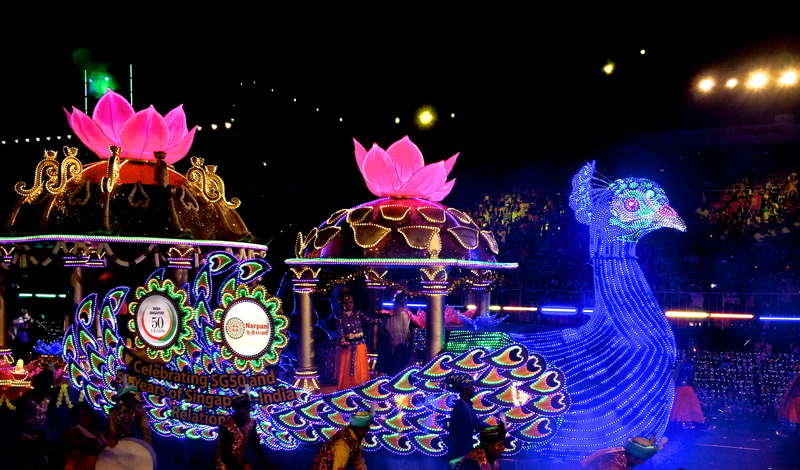 The Chingay Parade made its way through the Formula One Pit Building on Feb. 27 and 28. This annual street parade, held as part of the Chinese New Year celebration, is the largest street performance in Asia. The name “Chingay” comes from the Hokkien dialect of Chinese and means “the art of costume and masquerade.” With its roots tracing back to China, this event was inaugurated in Singapore in 1973. Back then, the celebration consisted strictly of Chinese customs and traditions, featuring dragon dances, martial arts and street opera. In 1987, Chingay invited a foreign group to perform at the parade for the first time. Four pop singers from Tokyo opened this event to the international entertainment arena, making it possible for other cultures to participate. 25 years ago, Chingay parade celebrated its Silver Jubilee with Indian classical dance, Japanese rock-and-roll, and five Alice In Wonderland-themed carnival floats. In 2004, for the first time in the parade’s history, 18 firecrackers were set off, starting a great tradition of yearly fireworks. That year, the number of displayed floats rose to 16, while the number of performers skyrocketed to more than 3,000. For many years, the parade covered only central areas of Singapore such as Orchard Road, Chinatown, and City Hall, but it recently moved to the Formula One Pit Building at the Marina Waterfront. This is due to the growing popularity of the event as well as its large scale. It is no surprise that Chingay 2015 is considered to be the grandest in history. Not only did it celebrate Singapore’s 50th jubilee, but it also showcased 11,000 performers and attracted about 180,000 visitors. However, Chingay’s large number of participants and visitors is not the only thing that brought success to year 50. The parade’s unique organization also made it stand out from the previous years. It was divided into four segments: Celebration SG, Memory SG, We ❤ SG, and Hopes & Dreams SG. The first segment of the parade couldn’t have happened without the help of a nine-month Community Engagement Program. Through this program, Singaporeans crafted one million colorful flowers from used plastic bags. The flowers were a part of a ‘gigantic flower bed’ that represented people’s wishes for the nation. “My first impression of the parade was that it was extremely loud, colorful, and patriotic. A lot of hard work was put into the dance routines,” said junior Savanah Russ. 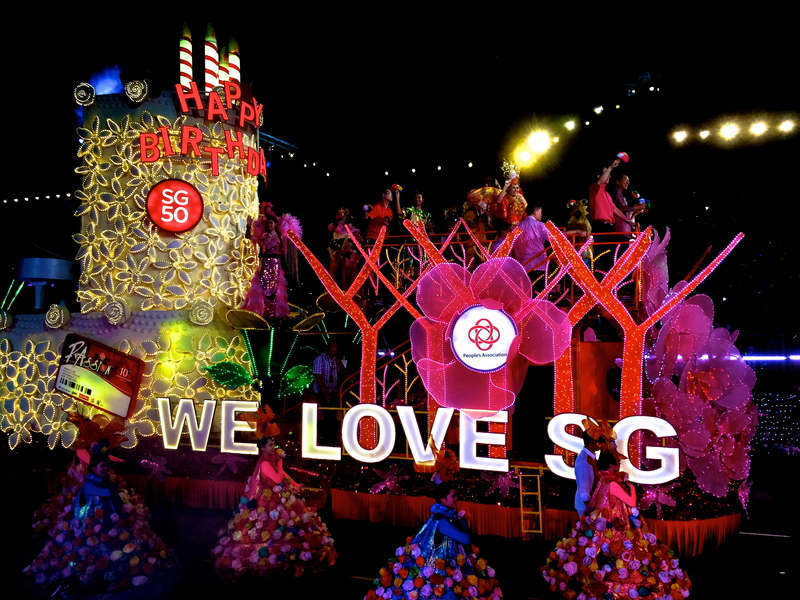 The parade opened with a gorgeous float “We Love SG”. Memory SG marked the first part of the parade by telling visitors about Singapore’s history from early ‘60s to the present. Symbolic of the 50th anniversary, Memory SG was meant to evoke a sense of nation’s pride. Besides expressing their own love for the nation, Singaporeans got to see foreign communities and organizations in celebration of the country’s 50th birthday. We ❤ SG showcased thousands of foreign performers from the Association of Southeast Asian Nations (ASEAN) as well as from Russia, Turkey, Rwanda, China, India, and South Korea. From Latin American ballroom samba to Golden Dragon Dance, parade visitors had a chance to see a variety of entertaining acts that made the third segment of the event a truly memorable experience. Hundreds of colorful dresses with lit-up wings didn’t fail to impress the audience. Continuing on the topic of community involvement as well as environmental friendliness, the final part of the show opened with a showing of 150 lighted trees and three tree floats with lighted We ❤ SG flowers. 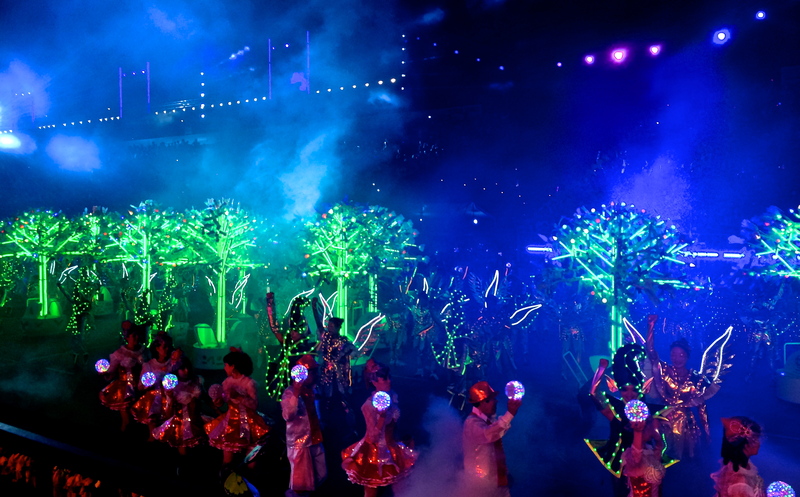 The trees were created by Singaporean communities and each lit flower was skillfully crafted from used plastic bottles. 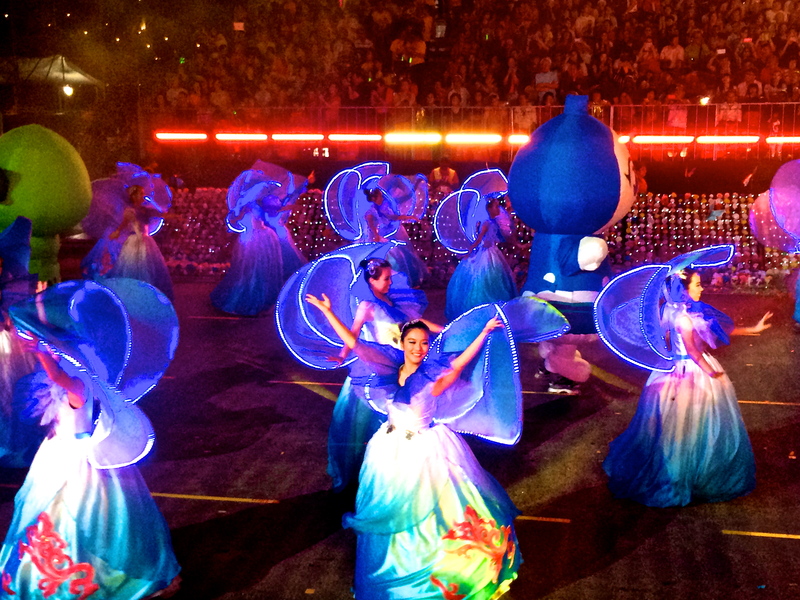 These were presented by 3,000 performers in lighted costumes to the beautiful melody of “Dreams,” a song by a Singaporean singer and composer. This beautiful finale called Hopes & Dreams SG served as a last reminder of Singaporean love and pride for their country. As people were leaving the parade to the sight of fireworks exploding in the night sky, it wasn’t hard to tell how impressed everyone was with Chingay 2015. The event turned out to be as unique and colorful as promised, truly a celebration of Singaporean identity. “My favorite part of the parade was definitely the founder’s float. I loved the Hawaiian shirt and the fireworks as the cake topper!” Russ said. The Chingay parade has become a large-scale, international event that keeps growing in exuberance and energy every year. The only question on everyone’s mind remains the same: how can Singapore top its 50th birthday celebration? Next For the Love of Music: Who are the most influential artists of today?